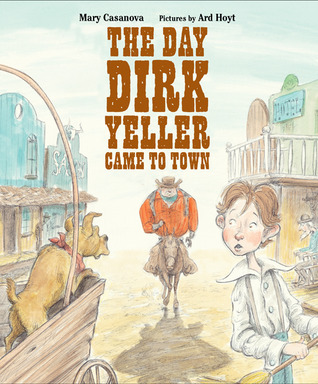 The Day Dirk Yeller Came to Town, written by Mary Casanova and illustrated by Ard Hoyt, was nominated for the 13-14 South Carolina Picture Book Award. Normally, I’m not a fan of westerns. (Yes, that tends to include picture books.) I made an exception, however, for The Day Dirk Yeller Came to Town. As a matter of fact, I challenge any book lover–particularly my fellow librarians–NOT to love this book. It’s wonderful on so many levels!